¡Hola amigos! Today, I’m writing to you from the bottom of Spain where a few days ago something rather unexpected happened. Meandering along the edge of the Mediterranean, eyes sweeping the sand like a metal detector, I was looking for cockleshells for a watercolor I wanted to paint in my journal when I noticed up ahead a blue something perched on a brick. I felt the titillating azure rush of adrenalin, which I’ve come love. To this day, my blue-dar remains finely calibrated. In fact, if I were to write about my cerulean addiction I would title the book Sixty Plus Shades of Blue, even if it does sound like the rantings of a heartbroken woman of abundant age gazing out at the cobalt sea, her lapiz lazuli earrings fluttering in the same wind that carries her lover to a younger woman’s shores. Moving closer, I realized that this was no ordinary blue object basking there in the sizzling Andalusian heat. 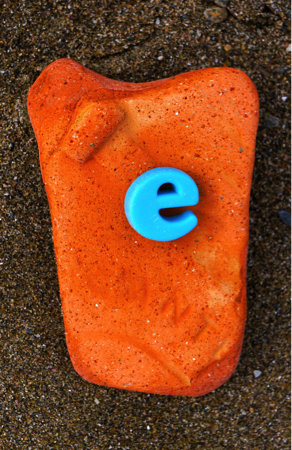 It was e, the letter e, a blue plastic lowercase magnetic one like you’d find in every kindergarten class in the U.S. before iPads were invented. Someone, perhaps a high priestess or a gull, had placed this priceless relic on a brick altar stamped with what remained of the mysterious incantation “ante.” It was magical! “Wow! You found the Internet Explorer e. Congratulations.” Sometimes my husband is a bit long on the obvious. 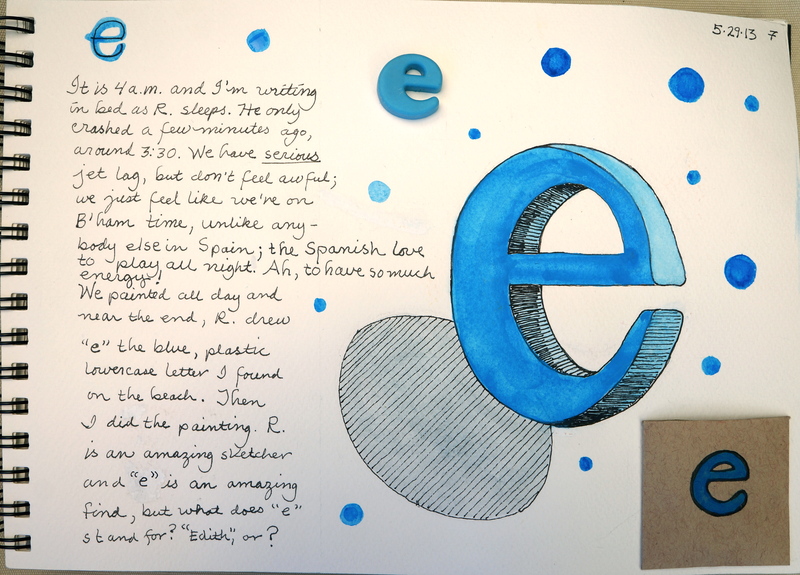 Rehydrated, we sat on our balcony parsing the meaning of the e, now moved, brick and all, to the glass coffee table on which we keep our journals, pens and watercolors. I had already started to build a shrine around the letter out of stones and green sea glass. I lit our 6 votive candles, though it was early afternoon. We thought of e-words. Edith…edith. Just the thought of my mom makes me laugh. She’d been quite a trickster when she was alive. Despite having to raise three kids on her own after my father died, she rarely lost her sense of humor. Instead, she expressed it in weird ways, like sending me to school with a single sardine tucked between two slices of bread, or hiding one of each pair of my socks so that I had to wear an unmatched pair (white and blue) to my First Holy Communion. Below are two pages from my journal on Spain. 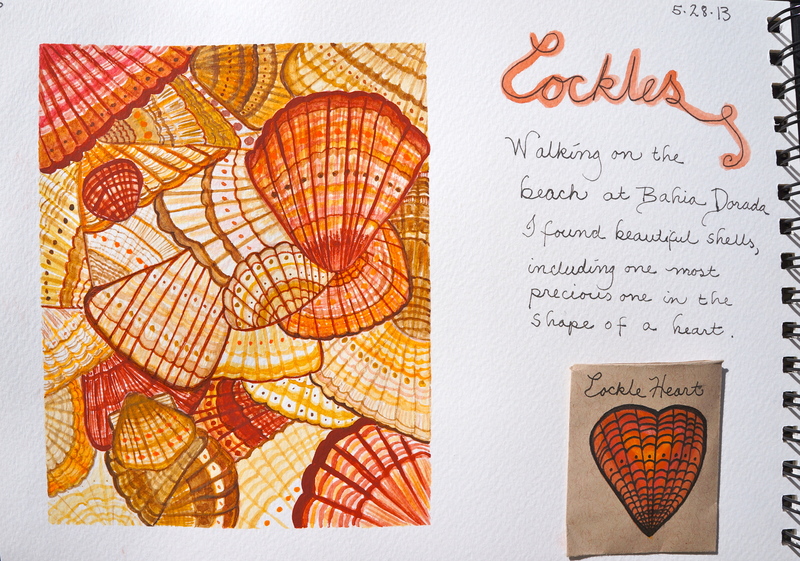 The first is the painting I made of cockleshells. On the second, R drew the big e just the way the real one looks. I painted it blue. Your journal pages are cool—and I really like how you weave stories within stories, creating these collage-style tapestries of a life—i.e. 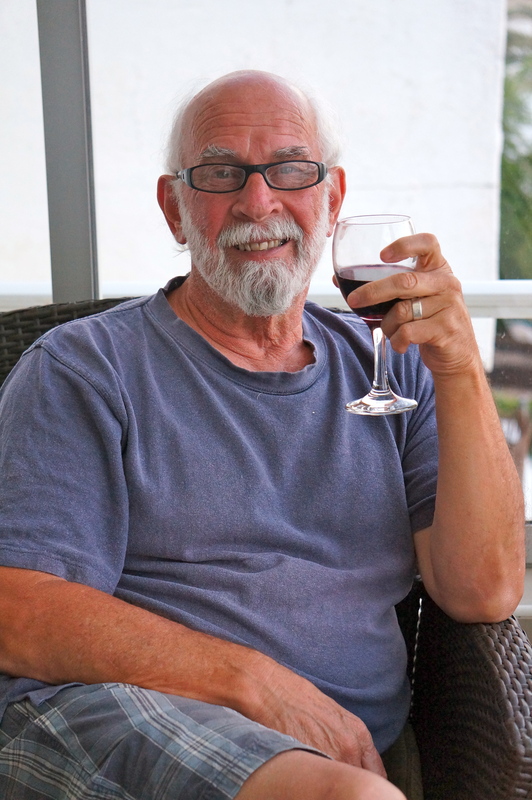 the human condition, and it’s magical qualities–and capacities. Thanks, jdawg! I’m totally convinced magical realism keep the world afloat, and us 2% sane. Powerful and wise, and that feels like the truth you are speaking…I want to carry these pearls with me on this day. Thank you. So pleased to help out and be on this journey with you my love. Wonderful post Susan. I love the way you find the mystery and magic in things. It’s something I share with you, and connect with you on. Love this. Your trip sounds so wonderful!! Hello to R.
I’m honored by your comment, D, and pleased to know that the awareness of mystery and magic is strong in you, as well. How lucky we are!